It’s been less than a year since Final Fantasy XIII-2 launched worldwide, bringing with it higher praise than its predecessor. The praise was deserved, the game improving on many aspects of FFXIII – though its story left many perplexed. It arguably created more questions than it answered, leaving fans in the dark and trying to piece together what happened. DLC was created allegedly to address this, but that too left even more questions once released in May. Perhaps the worst kept secret in history after being hinted as early as June, a third Final Fantasy XIII title is now officially confirmed via a 25th Anniversary event in Japan – and it will hopefully finally offer story clarity and more gameplay improvements. As expected, the game is a direct sequel to the events that transpired in Final Fantasy XIII. You play as Lightning – something fans have been clamoring for since her 5 minute debut in XIII-2. Given the events of XIII and XIII-2, Lightning is tasked with saving pretty much everyone in a new dramatic adventure through an open world. Similar to the experience found in Final Fantasy X-2, Lightning will have the ability to change into a variety of costumes which in turn give her different abilities based on what she’s wearing. There’s said to be over 20 different costumes available. The battle system is a modified version of the one found in the later two games. It will feature real-time elements such as direct control of Lightning’s movement, including a real-time block system, designed to make battles much more active and time-based. If you happen to face a game over, a prompt will activate to give players the choice to rewind their mistakes at the expense of the timer. The world of Lightning Returns: Final Fantasy XIII is different from the one we’ve come to know in the previous two outings. 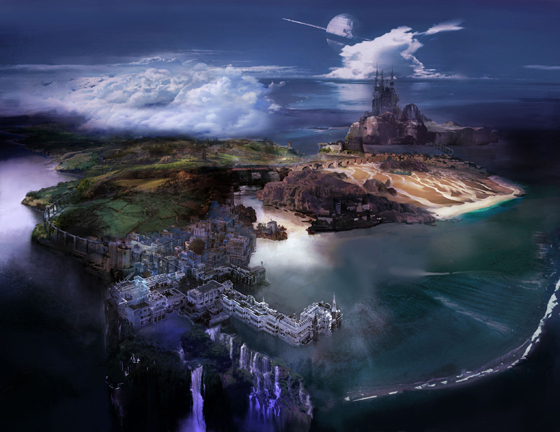 It’s supposedly more diverse, including RPG staples such as dungeons, towns, shops and sweeping landscapes. The name of the world is Novus Partus, which is set hundreds of years after the ending of FFXIII-2. One of the game’s cities is called Luxerion. The world itself is now set against a doomsday clock visible on the corner of the screen – and not dissimilar to The Legend of Zelda: Majora’s Mask, players are tasked with changing and shifting time itself to adjust events and buy yourself more time, pushing the world back from the brink of destruction. Any actions taken, even those such as time-based moves in combat, using transportation, or even facing a game over will train the time that remains. A large monorail serves to carry Lightning from place to place, with the bulk of the game world existing on four large islands. Writer and Director Motomu Toriyama says he’s chosen to make concept of the game linked to Lightning’s name, amongst other concepts. Lightning of course refers to an electrical discharge, but it is also tied to inspiration and epiphanies, a theme of the game. Lightning herself has changed because of this; in this new title she’s “stronger than ever.” However, the team has decided not to reveal her new look just yet. They did reveal that they told character designer Tetsuya Nomura that she’s facing her final battle – her legend is about to end – they want her to be determined and true, and to show what she’s made of. Three words define her gameplay experience: light, agility and elegance. As mentioned earlier, character customization will be key as the team wants to provide everyone an experience of only playing as her whilst having diverse gameplay. According to Toriyama it’s a brand new concept that’s never been used, and one of his original ideas in which everyone can create their own story. The world will constantly change – be it through weather, day/night cycles, the ecology, residents and more. The four large islands of the game represent a peaceful universe with luscious nature. As with any Final Fantasy, however, a crisis looms. With 13 days remaining, the end of the world will mark the end of humanity – so does death approach Lightning. Unfortunately Square Enix has decided against showing the game in motion. They instead seem to be taking their time with the reveal – giving fans a glimpse at the concepts and ideas driving the game first, and perhaps taking on feedback from those reveals and using them in the development of the game. We can at least be sure of one thing – Lightning Returns: Final Fantasy XIII is scheduled for a release some time in 2013 on both PlayStation 3 and Xbox 360. Posted in Final Fantasy XIII, Final Fantasy XIII-2, Lightning Returns: Final Fantasy XIII, Previews. I’m more interested in FFX HD.